My son is still in the NICU has been in for 72 days. He has bpd and struggles to eat and breath because he works so hard to breath. The Thing that bothers me is when people say they know how you feel. But never had a baby in the NICU. I have severe anxiety always have and most days this feels over whelming.. it would be easy to run and hide from my fears and anxiety.. but instead I work full time and go to school full time and have him to worry about. Glad to see I’m not alone with the ways I’ve changed since his birth. Hi jax! Thanks for the reply. She is doing wonderful! And does not usually ask directly about the prematurity. She does see things and compares to her Baby photos. Whenever she see a isolette or ng tube she always says “just like me”. She is at such a fun age! She loves arts and crafts , reading and snuggling. She has come so far and done so well. She still has to see a SLP for speech but she is definitely doing great. So great to hear how well she is doing now! Yay! I’ve always wondered how parents talked about “the beginning” with their preemies once they got older. Thanks for sharing! Thank you so much for sharing! This made my heart crumble. I am 4 years out from having my lo at 31.5 weeks. We were “lucky” she was 3.5 lbs and did fairly well besides some minor issues in the NICU, and developmental delays. To this day, everyday, I struggle with PTSD. I often equate that to the trauma of the NICU and my daughters prematurity, but also to the lose of our first child at 17 weeks. I am so sorry you have had to go through what we went through, and then more. I am also so thankful that I have someone who shares in my thoughts and feelings. The one thing that hit home for me was people saying “she is fine now”. I HATE that!!! It is true, she is fine, but I don’t know if I ever will be. I don’t know if I will ever get back to that “normal” feeling. Nights where I don’t reflect on the NICU, would be so nice. I don’t know, if I will ever stop feeling guilty for my body not being able to help her grow. I don’t know if my jealousy of other mothers and their “perfect” pregnancies will ever go away (seeing maternity photos makes me cry, because “we” never even got there), or even the fact that I lost my choice to have another child. It hurts! And just because things are getting better, does not mean that everything is fine. 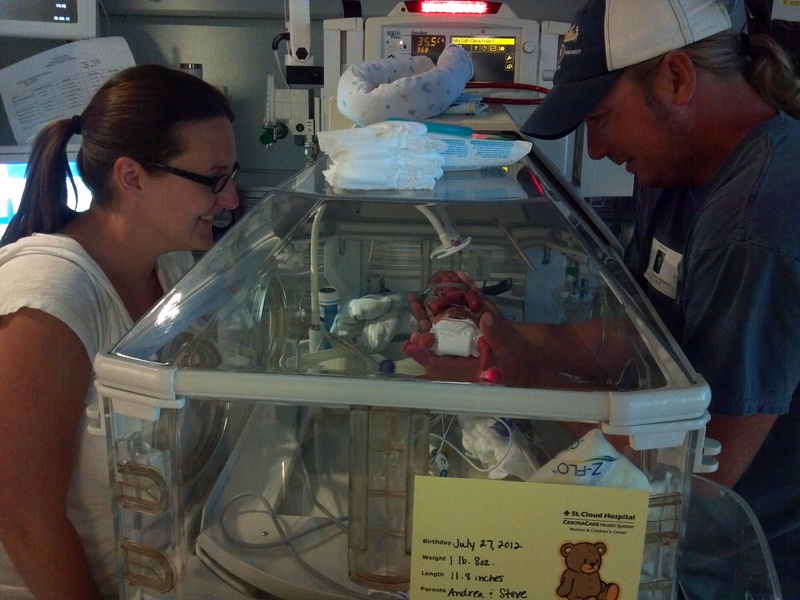 I am so thankful for my daughter, and in a way the NICU did help. I will never for a moment forget just how precious she is, I will not take her for granted. I will never forget how strong she is, and how much fight she has inside of her. Thank you for your post! From one preemie mommy to another! Thank you for taking the time to write Charmaine! It’s a long and difficult road, that’s for sure. I’m so happy your daughter had only minor issues. 4 years old must be a fun age!! 🙂 just curious, does she ever ask about her prematurity? Oh, Andrea, how far you have come to realize what you had all your life. I have been there in many different ways and at the end of the day, all of the lemons have made a lifetime of lemonade for me. I count my blessings so many times and appreciate so much more. I love each person for what they are and hold my “polish temper” waaay better than I ever did before in my life. So, it is so good to see your blunt honesty pour forth and that you now know who you are and why. The world should be loving you, as I do. God bless your every minute!!! Thank you! I, too, have somehow gotten my “Polish temper” in check over the years! 🙂 I feel like the last year has really help clarify a lot of things for me. Andrea, why must you always bring tears to my eyes? 🙂 Love you. I so relate to all of these, especially to #6, #8 and #9 and really all of them. lol. The flashbacks have ended but the anxiety hasn’t and I miss being respected (although I am sure that my almost 7 month will respect me in 15 years) at work. I too feel like giving back will help me to heal and have signed up to speak at a nurses workshop for new NICU staff. I hope sharing will heal me and heal other families. Thanks for sharing and making me feel like I am not alone as I sit here in the dark (6am) with a cold coffee and my gorgeous bundle of preemie inspiration passed out on my lap. LOL – yes, we will earn our respect in 15 years! 🙂 I think it’s great that you’re volunteering to tell your story. I think it really helps add a personal element for the nurses in training – it makes it more *real* – they are taking care of someone’s child and not just a patient. Let me know how it goes! Now, let’s go warm up our coffee!